Turbine servicing and maintenance can be expensive. 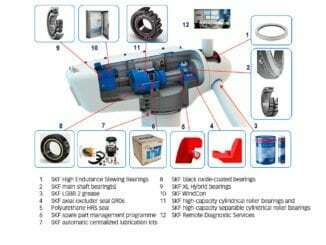 For example, pitch bearings, yaw bearings and gears, generators and main bearings are all areas where the correct lubrication regime is not only critical but, as a manual activity, time consuming and driven by the availability of the asset at the required time. Traditionally, the maintenance of many older, early generation turbines has been conducted using a predetermined programme of regular service procedures. Within these, manual lubrication is typically carried out at regular intervals, using set quantities of lubricants and regardless of the actual condition of the components in question. This approach is clearly wasteful and potentially adds to overall operating costs, especially in the case of offshore wind turbines. As a result, following years of experience and driven by the ever-increasing demand to reduce asset management costs, methods of lubrication have moved towards the use of far more effective and reliable automated systems. 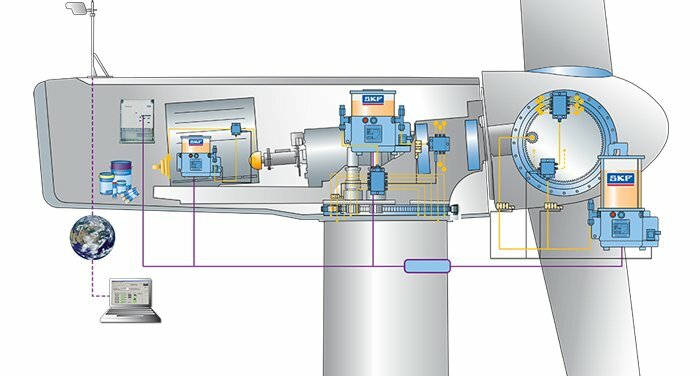 A good example are single-line automatic lubrication systems, which are ideal for wind turbines and other applications that must withstand harsh conditions. These automatically dispense precise amounts of lubricant to all lubrication points within the system while the turbine is in operation. Automated lubrication systems are now being adopted as a standard fit by large turbine manufacturers and have been shown to provide significant improvements in operational reliability and efficiency. This relatively low cost addition can provide a quick return on investment by increasing the availability of each turbine, extending maintenance intervals and preventing unforeseen failures of major mechanical components. As a direct consequence, additional savings can also be achieved through proper lubricant handling and reduced consumption. 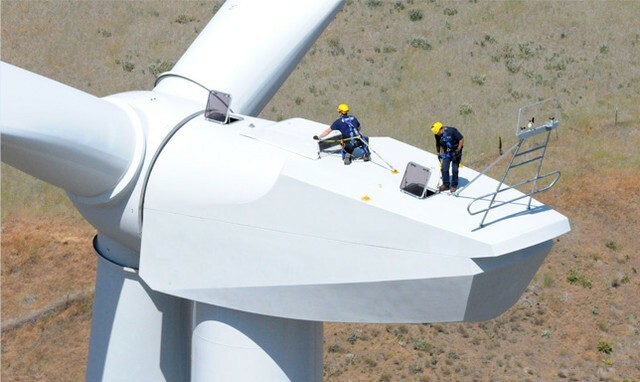 At this time, many early wind turbines are now being serviced and maintained by independent companies. This aftermarket is characterized by older, often smaller, turbines that are going through an upgrade to modern technologies and techniques to improve and lengthen the mean time between maintenance visits. 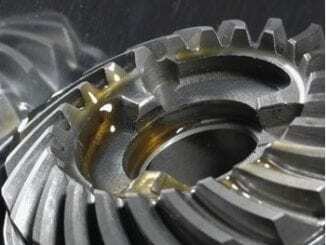 The service providers, operator maintainers, OEM service organizations and turbine owners managing these assets are requesting solutions for improved lubricating regimes, and for removing exhausted and spent lubricant, as well as training in maintaining and managing these assets. 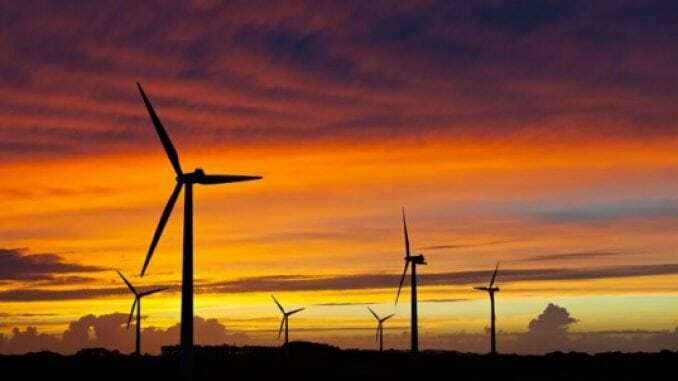 As well as needing to reduce the number of service visits, operators are demanding more feedback from these assets to maximize energy production and provide the data to ensure efficient management of operational costs. This can be met by introducing remote condition monitoring and diagnostics, linked to the output data from the lubrication system. This provides key information on the status and functionality of the lubrication system, making it possible to prevent bearing damage and unscheduled turbine downtime, helping to optimize asset efficiency and manage service periods, component part replacement and staffing resources. For more information go to SKF website.